Back in 2006 I wrote a post on my “Killer GTD Setup“ which still remains one of my most popular posts to-date on Flipping Heck. As the post is over 10 years old I thought it was time to update you on my current planning and organising set-up. I have tried many combinations of digital organisational tools from Wunderlist and Any.Do (read my review here), to a simple Google Calendar and more complex setups in Google Keep but I still find that online tools and phone apps don’t seem to offer the level of flexibility I feel I need to organise everything from films I want to watch in the cinema, Netflix shows I want to see, book recommendations and blog posts ideas to when my next pilates class is and whether this week is a general rubbish collction or I need to put the recycling out instead. Paper inherently offers the flexibility to add and move items easily and there’s also the added satisfaction if the physical action of crossing an item off as “done” – it makes it seem more final than just clicking a button on a screen. Bullet Journalling seems to be the new trend in the productivity arena. It has been steadily growing in popularity for the past couple of years, with tonnes of Facebook Groups and Instagram accounts devoted to it. My dailies form today and yesterday. Still playing with how to sort work and personal tasks, but right now I don’t care about that because it’s the weekend! (Which means I finally have time to go organize my closet because I still can’t find anything after the move.) Happy weekend, all! ?? To me there’s not much difference, aside from the “MinimalJoural” having neater handwriting than me! If only I’d come up with a catchy name for my system back in 2006 you could all be using my system now instead! Back in 2006 the idea of “Contexts” was very important to me. For those not familiar with the concept, a Context allows you to assign an “Area” to a task. For example, back in 2006 the task “Email Joe about the ACME Project deadline” would have a context of “Computer” (or PC in my terminology) because I would need to be at a computer to action this particular task – we didn’t have work email on phones back then (shocking, I know! ), in fact I didn’t get my first “Smart” phone until 2009. In 2017 we have access to email, the internet for research purposes, e-books, contact information and files all from the phone in your pocket so contexts aren’t really an issue any more but if you want to find out more about them then you can read my post about contexts and Getting Things Done here. Instead of contexts I now try to organise my tasks by project as this keeps similar items together and when I’m working I tend to batch process tasks from the same project to get through things more quickly. Working on one project at a time, moving through tasks on the same list really speeds up the processing of items. I use two planners for tracking my tasks and calendar items, one is a portable pocket-sized notebook I can carry with me at all times and a larger planner I keep in my office at home for keeping all my tasks and other lists in one safe place. In the past I’ve used a Moleskine Lined Notebook which worked quite well for my 2016 calendar layout but I figured that a grid notebook would suit me better this year. I chose a Herlitz A6 notebook as On Amazon UK it’s considerably cheaper than a Moleskine (there’s not much of a saving in the US as I think it’s mainly an E.U product). My main planner is a discbound Happy Planner which I love for it’s flexibilty and the fact that it lies flat unlike the majority of Filofaxes and A5 ring binders I’ve tried. 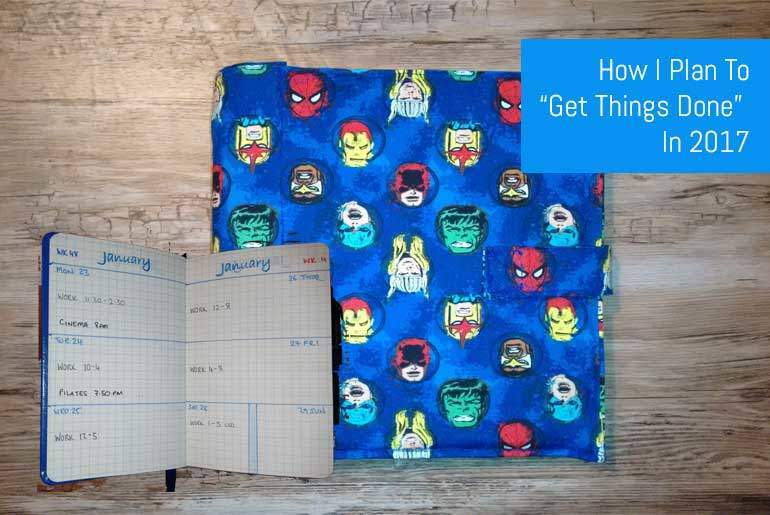 Additionally I can change covers easily so depending on my mood I can use the supplied cover or make some mischief thanks to a Harry Potter cover I designed or my fabric marvel themed cover which you can see in the picture below. The discbound planner allows me to add pages where I want so I can make sure all of my lists (or collections as they’re called in Bullet Journal terms) are together whereas in a notebook they would be spread all over the place which I find really hampers my productivity in terms of speed of sorting through items. As I mentioned previously, I organise each task into a single master list for each project but when I initially capture tasks they just go onto one big general list that I go through and organise later. Whilst this may seem like doubling the work, it actually helps me focus on the tasks more. When I take a task off of my general list to move to a project list, I can then think about whether it’s a priority task, whether I need to do something first before I can action it and whether I have assigned it to the correct project. With a bullet journal, you write all of your tasks down in the journal itself. This is fine if you are making your calendars on a daily, weekly or even monthly basis but I like to create my full yearly calendar at the front of my journal so I can plan ahead quite some time. Bullet Journalling does have a “Future Log“ which tries to tackle this calendaring limitation but it doesn’t seem flexible enough – or allow for enough information in my view. Writing tasks in the notebook itself means that if, like me, you do write a lot of tasks and ideas down you’ll soon get through the notebook meaning that you have to transfer all of your calendar information (and some lists) over to a new notebook. Considering it took me 3 days to set up my current diary, I really don’t fancy doing this every three months or so! In my pocket sized notebook I use my own A6/Moleskine notes and to-do printables which are sized so that I can fit multiple pages in the back of the notebook and pull them out when needed. I then take the items on these lists (which are basically temporary and disposable) and transfer them into my larger planner. There are some things that need to be tracked long term. For example I have signed up for an “Unlimited” cinema card so I essentially get to go to the cinema cheaper than a regular visit as long as I go at least twice a month. In 2015 I didn’t really keep track of how many times I went but when I worked out the films I had seen, my “special” card ended up costing me money so I decided to track the films that I see. These items can fit in either my portable or discbound planner, I currently track them in my portable planner but may move them to my discbound as the list grows. I also track things like items I’ve lent to people in my portable planner with a master list in my discbound, that way I won’t forget who I’ve lent a particular DVD or book to which has caused issues in the past. I usually need to refer to my calendar when I’m “on the go” or when I’m at work. Until recently I wasn’t carrying my phone with me so I had to have a way of keeping my calendar items with me when I didn’t have access to my Google Calendar. During 2015 I was using Google Calendar exclusively to manage my time so not having access to my phone (or a computer) during the day made it difficult to manage requests to change my working hours as I couldn’t remember what else I had planner. I then came up with the FlipPlan Free Printable Google Planner which allows me to print a pocket sized version of any of my Google Calendars, I then wanted to track at least three months in advance (rather that 6 weeks) so I swapped to more of a diary format. I also use the calendar that comes with the Happy Planner (although I have developed my own Calendar Inserts) as an additional back-up to track my schedule in case I lose my portable diary. Once a week I try to update my Google calendar as well so wherever I am I can see where I am supposed to be and when. This may seem like overkill to some of you but it’s cut down my usual double-booking myself which used to be my usual trick! One big thing for a lot of people is how to keep track of items they need to action regularly, want to read later, would like to do in the future or use for some particular purpose. Check back next week for how I organise both my paper and digital paperwork plus things I’d like to do – this deserves its own post as it’s quite involved! Are you paper or digital based in your planning? Has this changed much in the past 10 years? Let me know in the comments how you organise your to-do items and schedule, I’d love to find out which format you guys prefer so I can write posts that cover what you’re interested in.